This was originally a Luwian city which survived the dark age collapse at the end of the thirteenth century BC. Located in modern Syria, apparently it managed to maintain its Luwian character for a very long time, but at the start of the ninth century it, like many cities in the region, was occupied by increasingly strong Aramaean newcomers who founded a small state of their own. Known to the Assyrians as Unqi, the capital of this western Aramaean state was at Kunalua (Kinalua, Kalneh, or even Kinaluwa), which has been tentatively associated with the mound of Tell Tayinat in modern day Turkey. It was formed in the ninth century BC towards the end of the dark age period, and shared a north-western border with Que. Khazazu (modern Azaz) was one of Pattin's dependencies which was invaded by Assyria in around 870 BC, suggesting a territory which stretched well beyond the Amuq Plain. The frontier fortress of Aribua within the land of Lukhuti to the immediate south of Pattin was also ravaged. The political situation for Lukhuti is not clear, and by the reign of Shalmaneser III (859-824 BC) it probably formed the northern province of Hamath, and perhaps did so by as early as 870 BC. Ashurnasirpal II crosses the Euphrates with his Assyrian army, erupting into Syria. Pattin is one of many small states invaded by him, and Lubarna pays tribute. Perhaps by this time Lukhuti, the territory to the south of Pattin, is in the hands of Hamath. 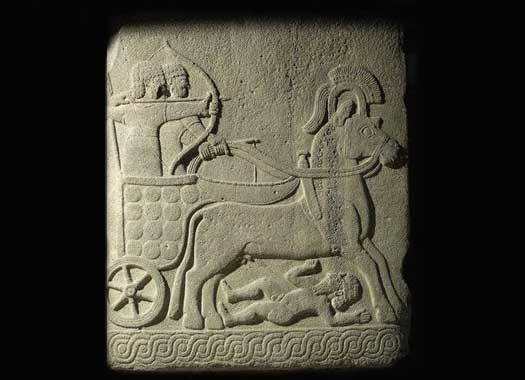 There is a minor school of thought that Sapalulme is in fact the Hittite king Suppiluliuma I, and that the chronology of the entire Hittite kingdom should be adjusted downwards by around 400 years. However, when examined closely, this theory seems to fall apart, and cannot be supported. Qalparunda (alternatively Kalparuda) is generally identified with Halparuntiyas, whose name appears on the fragmentary base or podium inscription from Tell Tayinat, although the inscription and sculpture are too mutilated to yield much information. Murdered and replaced by a usurper. Assyria's military commander in Syria puts down the revolt in Pattin, placing a replacement upon the throne. This act suggests Assyria is still in a position to interfere in Syrian affairs. Pattin has been safe for as long as its eastern neighbour, Bit Agusi, holds out, but when that state falls, Assyria defeats Tutammu and turns Pattin into a province.